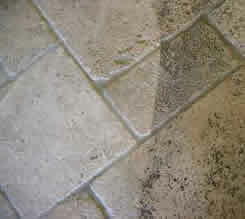 We don't use high pressure cleaning as this can damage loose grout or floor surfaces. Instead we utilise the world's best equipment with unique wash, scrub and dry technology. Using less water and detergents than other cleaning methods. we provide highly professional stone floor restoration, tile cleaning, tile sealing, grout sealing and grout cleaning services. We specialise in stone floor restoration together with cleaning and sealing a wide range of stone floor tiles. 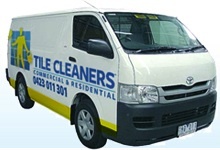 We also provide both ceramic and porcelain tile and grout cleaning services. In addition to tile cleaning and sealing stone tiles, your floor may require a certain amount of restoration work, in order to restore it to its original beauty. Our professional stone floor cleaning methods involve using polishing pads, together with water and non abrasive cleaners, to gradually grind the surface of the tile and prepare it for polishing. This process will restore your stone tiles to their original shine, ready for sealing. Ceramic tiles and Porcelain tiles can usually be cleaned with our rotating machines that will clean and dry your tile floors in a single pass, ready to walk on immediately. The newer ceramic tile flooring creates a problem on two fronts. First, the tile surfaces are engineered with more texture than ever before making the mop less useful and effective. Secondly, and even more noticeable and problematic, the grout between the tiles has even more texture to trap dirt residue left by mopping. The problem is the cementatious lime based grout easily absorbs moisture, oils and sugars that in turn attract bacteria, dirt and other solids that change the overall appearance by darkening the grout. Other porous surfaces like brick, Italian quarry- tile, limestone and other engineered flooring all acts like concrete or grout, absorbing liquids, oils and dirt to a point that their appearance also darkens with time. Chemicals can dilute the grime well enough, but without effective removal the formed slurry only soaks deeper into the grout. 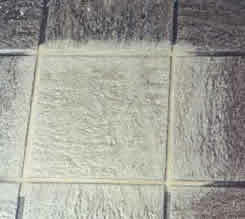 Rotary scrubbers fail to reach into the grout lines or the texture of the tiles. 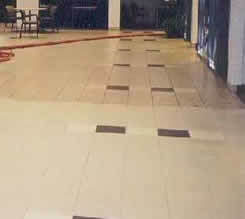 Tile and grout is often associated with food halls, restaurants, rest rooms and leisure areas. Dirty tile and grout is not aesthetically pleasing. More importantly it is unhygienic. 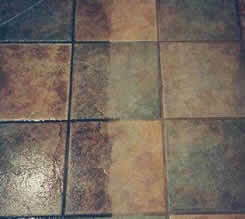 Bacteria collects in the grout lines along with oils, food matter, sugars and moisture. The final "mop and bucket "of the day further exasipates the problem further adding more moisture and dirt. 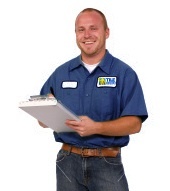 TileCleaners's Grout Sealing Process Protects Your Grout Lines For Years To Come. We Have A Revolutionary Tile & Grout Cleaning Process That Makes Your Grout Lines Stain Resistant, Waterproof And Sanitary For Years Comes.